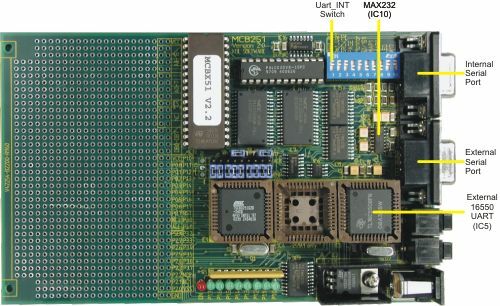 The MCBx51 board connects both the on-chip serial port and the external UART to the MAX232 (IC10), which converts the logic signals to RS-232 voltage levels. You can configure the Monitor to use either the on-chip serial port or the external UART for the communication with the PC. The on-chip serial port is derived from the internal serial functions of the 8051/251 (P3.0/RXD and P3.1/TXD). The external UART (IC5) is implemented using an 16550 device. A 1.8432 MHz oscillator provides the input frequency to the UART. The interrupt output of the UART is optionally connected to the INT0 pin (port 3.2) of the CPU. When the Uart_INT DIP switch is ON, the UART interrupt is connected to the INT0 CPU pin. The serial ports (Internal and External) are configured as a standard 3-wire interface. The DB9 connector is wired to loop the PC's handshaking signals back to the PC. Refer to the figure below for details.